In Greece, coffee is an integral part of the culture. You would be pleased with the excellent quality of Greek coffee houses: in any weather and in any café, first of all, a glass of drinking water with ice would be brought, and then – a plate with cookies or lokum. This treat is offered to all guests on the house. The better the view from the coffee house, the worse the coffee and more expensive the price. In such cafes, it is better not to order the Greek coffee, which requires great skill. Just limit yourself to those types of drink, which the coffee machine is able to prepare. The more Greeks at the café, the cheaper and better the coffee is. If there nothing but the coffee is served- it is definitely an excellent coffee. If the place is not just a coffee house, but also a chocolate house, be ready to spend a lot of money, as you would be definitely tempted by the local sweets. Long and short of it- the coffee is a very popular type of drink in Athens and you will find many places, where it is served. The fastest way of searching for them is to rent a car in Athens Airport. It is obvious that the coffee appeared in Greece during the Turkish rule. Being a part of the Ottoman Empire, people here first tasted the black coffee earlier, than in the rest of Europe. On the territory of Athens and the southern Greece, the coffeehouses appeared in 1760th. They were small, unattractive, and visited by the Turks only. However, little by little, the Greeks began to come there as well. Then, the coffee houses spread for the rest of Greece. The first purely Greek coffee house or “kafeneio” appeared in Nafplion in 1828, after the Turks’ expulsion from the territory of Greece. Nowadays, when you see only men of retirement age, sitting at the tables of the café- this place is the very kafeneio, a special sort of cafe, which serves as a meeting place for elderly people. Until the beginning of the twentieth century, the coffee houses were not simply the places, where visitors are having a cup of good coffee. They fulfilled the role of the specialized stores, in which coffee beans were sold. There they were also fried, and then grinded in small handheld coffee grinders. To roast the coffee, the special containers were used, which in shape resemble large pots with a thick bottom. This “pan” was covered with a metal lid with a long handle for continuous mixing of the coffee, so that it would not burn out and could be evenly fried. In large coffee houses, in order to attract customers, there was even a special person, who was sitting near the entrance with a coffee grinder in his hands and ground the coffee. Not fried and not ground coffee was sold by weight in grocers, where small-scale retail goods were sold. The homemakers bought green coffee beans, fried and grinded them at home, and, as the coffee was very expensive product, the barley, millet or chickpeas were added to this mixture. There is no doubt about a huge number of coffee-lovers in Greece. The so-called Greek coffee remains the most popular kind of coffee in Athens. On the second place, there is frappe – the cold coffee. 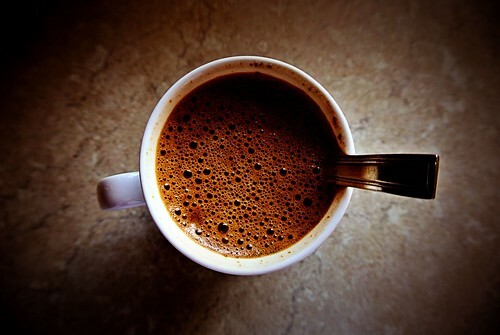 Greek coffee is prepared from a mixture of different types of ground coffee, in order to get the richest flavor. As a rule, the coffee is mixed before the roasting, although it sometimes happens that it is fried first and then mixed, but, in this case, the process takes more time. Usually, this mixture of coffee beans is prepared from Brazilian coffee grades- Rio and Santos. Depending on the degree of bean roasting and the proportions of the coffee mixing, the taste of the drink may differ significantly in different Greek coffee brands. When Greeks want to say- “to make coffee,” they use the verb “bake”. The thing is that earlier, the coffee was baked – the full coffee pot (here it is called “briki”) was put either in hot ashes, or in a box with sand, which was put on the fire. There the Greek coffee was slowly “baked”. The briki should be high enough and not very wide, ideally, with a narrowing neck, so that the coffee temperature could evenly share and the foam would be of high quality. The secret of delicious Greek coffee preparation is in a slow fire- a slow process helps to emit all flavors of the coffee. Only with the proper preparation, you can appreciate the taste of this drink. A cup of delicious flavored coffee will invigorate, clear your head, but do not forget that more, than 2-3 cups a day, could be harmful for your health. Sugar is added before the preparation, so tell the waiter what type of coffee you want: a sketos (without sugar), metrios (medium sweet) or glicos (sweet). Traditionally, Ellinikos is served in copper glass holders and on the copper saucers – in order it is cooled down more slowly. This coffee is usually drunk slowly, to take a delight in drinking it for at least half an hour, or even longer. The second most popular coffee in Greece is frappe. During the fascist occupation in the forties, shops began to close one by one, because of the cessation of the deliveries. Only a few remained, as they started making the surrogate of coffee. In the post-war period, in Greece, people began to use the dry coffee extract. In the large cities, the various cafeterias started to open. In one of them, the Greek cold coffee ‘frappe’ was served for the first time. It was invented by chance, in 1957, at the International Exhibition, held in Thessaloniki. Dimitris Vakondios, the dealer of Swiss company Nestle, was representing the firm production for children – a soluble chocolate drink, which consisted of a dry milk, instant cocoa and sugar mix. The mixture should be diluted with water and whipped in a shaker. During the break, Dimitris wanted to drink an instant coffee, produced by the same company. 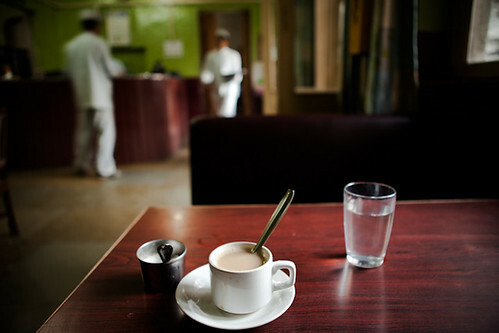 As he had no hot water, he decided to froth the coffee in a shaker together with the cold water, sugar and milk powder. It turned out that this coffee drink is delicious and refreshing. The taste is rich with a slight flavor. The name of a drink came from a French word ‘frape’, which means ‘foamy’. It is not very difficult to prepare frappe at home. You will need a shaker, dry coffee extract, cold water, sugar, ice and some milk. Put in a container two teaspoons of sugar and 2 tablespoons of dry coffee extract. Mix everything well with a dry spoon, so that the sugar would dissolve well and the drink would not be gritty. Add a little water, about one third of the shaker. The most important is to get a thick foam, so close the shaker lid and begin to shake it hard as long as the mixture brightens and turns into the foam. Pour the contents of a shaker into a tall glass, add water, but not to the edges of the glass- leave the space for a few ice cubes. The drink is having low calorie content. The caffeine content is approximately equal to the standard portion of espresso. In Greece, people usually drink frappe in the first half of the day or between the mealtimes.